The Who: Live at the Isle of Wight Festival 2004. Featuring Roger Daltrey, Pete Townshend, Simon Townshend, Pino Palladino, Zak Starkey and John “Rabbit” Bundrick. Distributed by Eagle Rock Entertainment. minutes. Not Rated. The Who’s 1970 performance at the Isle of Wight festival is legendary in rock circles, drawing an audience of about 650,000 people. The show was often bootlegged, because at the time the band did not release it as a live album due to the recent release of The Who: Live at Leeds. The show did not get an official release on CD and video until 1996. The band, in the meantime, never made it back to the famous festival, because the original festival – whose lineup also included the likes of Jimi Hendrix, Miles Davis, Jethro Tull, Chicago, The Doors, EL&P, The Moody Blues, Joan Baez, Free, Joni Mitchell, Leonard Cohen, Kris Kristofferson, Donovan and John Sebastian – was so crowded that it was declared a safety violation. The government passed a law making it more difficult to set up shows for more than 5,000 people, and the Isle of Wight Festival was not held again for over 30 years. Ironically, after having played the third (and final) year of the original festival, The Who also ended up being at the third year of the revival of the fest, which has been on-going again since 2002. The crowd was not quite as big as 1970, but there is still a huge field stuffed full with bodies – not bad for a band that was old enough to be many of the fan’s parents. In fact, Pete Townshend teases the crowd that many of them may have been conceived during the 1970 Isle of Wight show. There is a bit of a question why The Who – who have so many live albums and videos on the market already – would choose this thirteen-year-old show, from one of their many reunion tours, to release. Particularly since just a year and a half ago they released a similar British festival concert (that one at London’s Hyde Park), with a similar set list, from their then-current tour. Therefore, whether you pick this video (and 2-CD audio set) over another Who live set may revolve around how you feel about Endless Wire, which was released two years later to a huge amount of critical acclaim, but did not become a best-seller on the level of previous Who classics like Who’s Next, Tommy, Quadrophenia and Who Are You? Still, completists will be happy to have concert versions of these songs. However, the group just has such an amazing catalogue, that it’s hard not to sit back in awe of the group’s musicianship. Kicking off with their first single “Can’t Explain,” the group blows through such classics as “Substitute,” “Who Are You?,” “Behind Blue Eyes,” “Baba O’Reilly,” “My Generation” and “Won’t Get Fooled Again.” By the time the band downshifts into a closing selection of songs from Tommy – also a Who concert tradition – the audience, both at the festival and watching it on screen years later, is hooked. 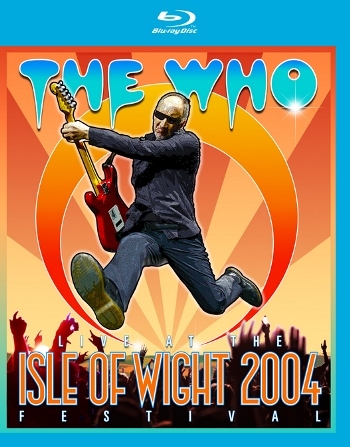 Roger Daltrey is in good voice and Pete Townshend is frisky and in good humor (he isn’t always so upbeat in concert), so for a hardened fan or even a casual one, Live at the Isle of Wight Festival is a worthy investment.. Copyright ©2017 PopEntertainment.com. All rights reserved. Posted: July 7, 2017. Tags: 5:15, Baba O’Reilly, Behind Blue Eyes, Drowned, Endless Wire, It's Hard, John “Rabbit” Bundrick, Live at the Isle of Wight Festival, Love Reign O'er Me, music video, My Generation, Old Red Wine, Pete Townshend, Pino Palladino, PopEntertainment.com, Real Good Looking Boy, Roger Daltrey, Simon Townshend, Substitute, The Punk and the Godfather, the who., Tommy, Video Review), Who Are You?, Won't Get Fooled Again, Zak Starkey. Bookmark the permalink.